Remember… if you want the type bigger and easier to read, hold down the Apple (command) key (Mac) or Control key (PC) while hitting the + key or rolling the scroll wheel on your mouse to enlarge the type. No workout this week, but read below to start loving your workouts even more… for microscopic reasons…. Tuesday Blog Review: Not a single response to the Tuesday Trivia from last week. So, I’ll repeat, but with an added clue. Sometimes answers in life are hidden in plain site. October 21st was a landmark day for a number of events. Three of them are hidden right here in this paragraph. Hover (your cursor) in various places here for awhile and they just may make themselves apparent. You will need to respond with exact wording in your answer to be correct. #1 – Bleach is not a healthy chemical. Linen or cotton clothing can be whitened by boiling in a pot with one part cream of tartar to 3 parts water. #2 – Add a yard of nylon netting (tulle) to your dryer with the wet clothes… it will catch most of the lint. #3 – The whitest socks are boiled in a pot with a lemon slice added. stirred me to explore the science behind the book’s claim that interval training is a virtual Fountain of Youth. 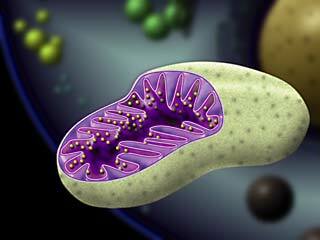 Mitochondria are often called the “power plants” of the cell because their main job is to make energy. Mitochondria are highly unusual–they contain their own genetic material and protein-making machinery enwrapped in a double membrane. Besides their role in energy production, mitochondria participate in a natural process called programmed cell death–or PCD. When mitochondria function is enhanced, the corporeal cells turn over, regenerate (where applicable) and function at a higher level for a longer period of time. Furthermore, activity level correlates with improved mitochondria function. The harder a person exercises, the greater are the mitochondrial changes, leading to a bigger reduction in biological age over the life span. Interval training is one of the most effective ways to exercise at a high enough intensity to significantly increase oxygen demands and ultimately slow aging (Wright & Perricelli 2008). The following exercise variables can be adjusted to increase difficulty and create a variety of intervals. Bottom Line: Regular, high-intensity exercise can slow aging by more than a decade. Interval training is the easiest and most effective way to incorporate high-intensity exercise into any exercise program. The key is to choose exercises that use large muscles, are done in a way that is biomechanically correct and will get the heart pumping to increase maximal oxygen consumption. Interval training can be done at ANY level, by ANYONE. Buy the book above (if you click on it it will take you to the Amazon link), or buy a similar book, or find a trainer who can guide you appropriately. It’s not rocket science, but the effects just may be transformative. Thanks to my spawn, Dina R., for sending this fun link in… click to see what was the #1 song on the day you were born…. 1991 24 die in Oakland hills fire. BOILED socks?? Have I missed something? who is showing up at the track these days-The women from Little House on the Prairie? Pretty colours in that cut open lima bean thing on the blog though. PS. Layla, darling, there is this genius little thing in the dryer known as a “Lint Tray” now. If you leave it collecting long enough it will make little scarves for your pets. okay why are you sending laundry tips we come to the track and breakfast to escape that kind of activity and to think about boiling.